If you’re looking for some great DVD Storage Ideas, take your time, do some research and read the reviews, before making a decision on which case to purchase for your needs. Here’s an insider look into 5 different DVD Storage Units. The Atlantic Mitsu 5-Tier Media Rack is one of those amazing DVD Storage Ideas that you really shouldn’t miss. With it you’ll finally have a very nice way to keep all of your movies organized instead of just having them in piles everywhere. Its vertical design makes it great for holding video games beside your TV stand without taking up much room. My favorite feature is that it basically has bookends built in – there is a sliding divider on each row. This is perfect for keeping your stuff from falling over if you only have a few games or movies on a row. The dimensions when assembled are: 12 1/2″ Wide x 9 3/4″ Deep x 40″ High (a smidge over 42″ with DVD’s). The stand comes in a lot of pieces but goes together fast and easy, it should take about ten minutes to finish. Instructions aren’t complicated at all. Also, no additional tools are needed, as it comes with everything you will need. Maybe you might need a screwdriver or something for the optional wall mount attachment. There are 2 wall braces that require being screwed into the wall which makes it super sturdy. They are beautiful shelves, a very dark smokey color that gives it a PlayStation look. This is a great movie rack for anyone. Overall a very good purchase for your DVDs, XBOX games, PS4 Games, and BluRay Movies. Check out the Atlantic Mitsu 5-Tier Media Rack here. If your looking for a nice case then LINKYO 520 CD/DVD storage Binder Wallet is the one to look at. 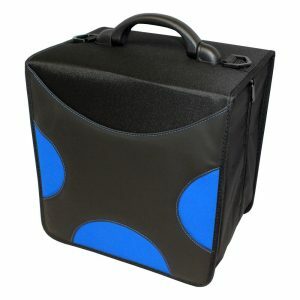 It is an excellent carry case and storage for your DVD movies and CD music collections. Heavy enough to protect on the outside and smooth enough to protect the disc on the inside. The case has 4 separate sets of plastic ring binders inside to keep page turning smooth. DVDs and CDs are held in place by a plastic flap at the top. The sleeves are gentle and face the right direction. The zipper has some extra slack so that it zips close without an issue. As long as you keep to one disc per slip, this should hold nicely for your needs. With LINKYO you can toss all the DVD boxes and keep only the discs rewarding your family with a ton of reclaimed space. This is the only CD/DVD Holder that feels like it would last. Others tend to stretch and wear once reached maximum capacity. This case, when stored correctly holds everything they way it should, protecting your discs. This Binder Wallet is A+. It looks more like a top hat box than a disc holder. The handle is very strong on this bad boy. What a great item in our DVD Storage Ideas quest. Check out the LINKYO 520 CD/DVD storage Binder Wallet here. If you refuse to live in fear of your DVD collection being damaged due to excessive dust check out the CoZroom Set of 2 DVD Storage Bags. They are just off the hook. You can always keep your DVDs organized and if you move often you won’t need to be packing and repacking them every time. They’ll be ready to go every day. 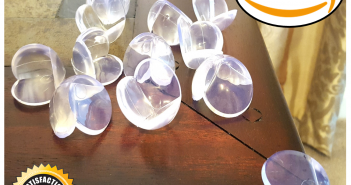 The bags are made of transparent vinyl so it is very easy to clean it up, and because it is transparent you don’t need to be taking out all your DVDs to be searching for the one you want to watch, you can identify it very easily. The vinyl is high quality so your DVDs will always be safe. Also, the strap is tough so it won’t break no matter how much you are carrying them. These storage bags will allow you to keep ALL your DVDs stored without any furniture, move them around, and even see which films are where without even opening them! Just be aware, if you are stacking them. Ideally you want your bag to be full so that it properly holds its shape, especially if it has other things on top. Absolutely top notch, a great buy of anyone’s money. 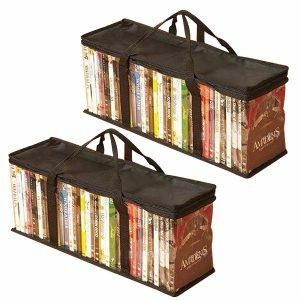 Check out the CoZroom Set of 2 DVD Storage Bags here. 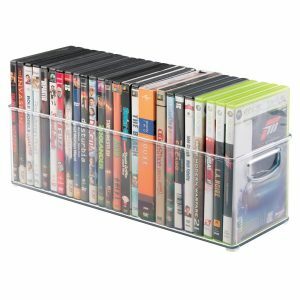 If you are looking to shed the jewel cases, the Ideastream Snap-N-Store DVD Storage Box is the item for you. These storage boxes are Fantastic. What an ingenious idea! It arrives flat, you snap it together (takes maybe a minute to do – super easy), and it holds tons of CDs. Even when you don’t fill up one of the halves with CD’s, it seems to be snug enough that they’re not prone to falling over. The outside looks leathery, with a chrome gloss which is neat! It holds even more than advertised (about 64 in full-size jewel cases) and is quite sturdy. They will provide a place for ALL of your DVDs, and you can actually keep them in alphabetical order. 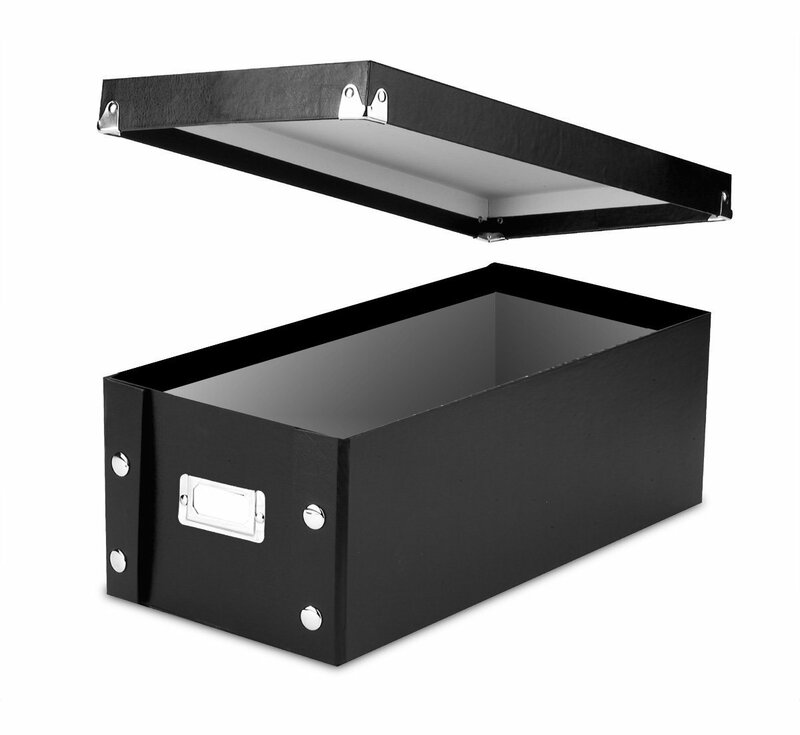 It’s durable and sturdy and doesn’t take up much space. The double boxes can be heavy when filled, and the smaller ones are easier to handle and arrange on a shelf. It is exciting to have something not only function as intended but go above and beyond what you expected. A great, inexpensive solution to storing your CD’s. Check out the Ideastream Snap-N-Store DVD Storage Box here. Tired of how messy your games and movies look on the bookshelf? The mDesign Household Storage Bin is exactly what you need. It is a simple, yet efficient way to organize your DVD collection. The acrylic is substantial, so the tray itself is sufficiently rigid to retain its shape, whether full or partially loaded. Perfect for forming the outside row of DVDs on your game shelf. The DVDs stay upright, even when you remove one or two. You can also see the titles of each case. When you need to view DVDs behind them, simply remove the bin, get the selection from the back row, then replace the bin for neat and orderly DVD selection and viewing! An added bonus is that the bins are stackable (if contents are below the lip) so you can get as much of them as you need. They look nice and the handles make for easy pulling in and out of your shelves.Your DVD collection will look attractive instead of just being stacked up. Check out the mDesign Household Storage Bin here. When you invest in appropriate storage solutions you save both space and time. Your apartment will look better and your life will be much easier. Not to mention all the great memories that you’ll be keeping safe. 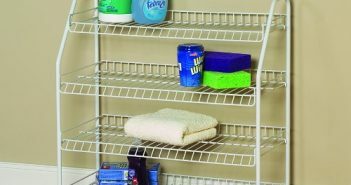 All you have to do is make that decision to organize your home today with the help of one of these brilliant DVD Storage Ideas.